Ritual, art, membership to a cabal of manly-men-boxing-fools in a brew pub — these have never been associations I’ve had with shaving. As Tim has already indicated, our dad gave us a pretty abridged shaving tutorial. Along with scant demonstration, he may have mentioned, “Try not to kill yourself.” Whether he did or did not impart this final kernel of wisdom, there was no follow-up lesson or even a check-in to see if we had garroted ourselves. As a result, for pretty much all of my shaving-life, I have half-shaved at best. My father’s lack of teaching surely contributed to this, but so did the milieu of the ’90s. In the social circles I traveled then, there was no stigma associated with whatever you decided to do with your facial hair. By the end of the ’90s and the early ’00s, I was shaving maybe once a week. Eventually I found a decent beard trimmer and with it, my shaving became more erratic. Sometimes I had a beard, sometimes I had a shadow, sometimes I was clean shaven, sometimes I had an experimental look, but most of the time I had some amount of hair on my face. This was largely because in those instances when I was clean shaven, I would never continue to do so beyond a couple days because I’d either forget to keep up with it or I got razor rash. Still, I do razor shave on occasion, and when I do, for nearly two decades it has been with a Mach3. As Tim has also duly noted, the Mach3 is really the bane of shaving. After it materialized in 1998, the facial hair horizon was forever leveled. It is as if no other razor had ever existed since or after. With it, razor cartridges were to forever be things that existed behind locked glass, and the only thing better than three blades was more blades. 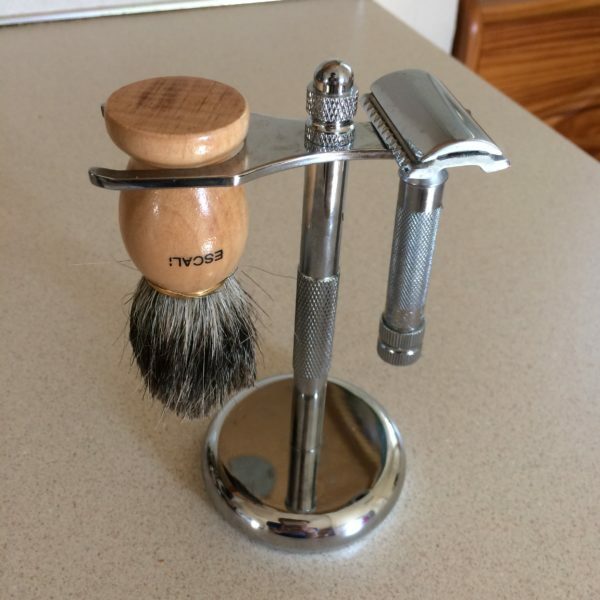 About a year and a half ago, I decided to razor shave; accordingly I dug out my Mach3. Problematically, I had no idea which blades were old, new, or rusted. Because I don’t razor shave that often, this frequently happens to me, and when it does I inevitably just go out and buy all new blades. This time, however, out of spite for the Mach3, I decided to explore other options. This eventually led me to buying a safety razor. While this does potentially mark me as a hipster, after reading up on them, I decided that I shaved infrequently enough to invest in something as arcane as it was asinine.